Even in the Middle Ages, Flemish textile products had an excellent reputation throughout Europe. Everyone envied the talent of the Flemish weavers. Nobody was their equal in combining beauty and quality. Within this world of know-how and creativity the great Flemish carpet tradition grew. The beautiful city of Kortrijk, cradle of Louis De Poortere, became the centre of this industry. 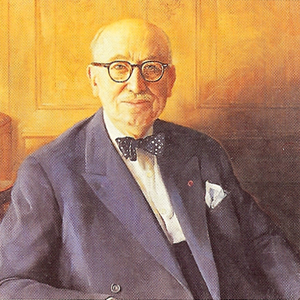 When Louis De Poortere established the company, named after himself, in Kortrijk in 1929, he could rely on the solid experience acquired since 1859 by the family company De Poortere Freres, cloth manufacturers and merchants. But Louis De Poortere's innate desire for innovation forced him to explore new horizons. He started designing carpets with Oriental patterns which immediately enchanted the British market. Year after year, Louis De Poortere carried on with his innovations: he diversified his collections, explored new production techniques and multiplied his creations. Staying ahead in technology. To have complete creative freedom... Louis De Poortere has always provided all the necessary means to create. As innovator, designer and pioneer, Louis De Poortere characterized his company with his desire for progress. Thanks to its high technology, Louis De Poortere already lived in the future. Its extensive machinery, which masters the most advanced techniques, enabled the company to offer the world's most diversified range of products. The Louis De Poortere philosophy is based on a simple concept : we aim to be more than just a manufacturer of carpets. In branching into home decorating, we have had to increase our creativity to meet your aestetic requirements, and this has stimulated us to tranform generic into magic. Because people are increasingly seeking beauty, elegance, value and comfort for their homes, our designers and technicians have created entire collections that are modern and accessible, and designed to bring you the upmost pleasure. Because your demands are becoming increasingly specific and your tastes more assured, we have developed bold concepts that are simple and attractive and will enable you to easily reach ultimate sophistication in your floorcovering. At Louis De Poortere you will find rugs, carpets, stair runners and even taylor made rugs, which you could freely mix and match to make your decorating "home sweet home" experience a pleasure. Our passion is to offer you this pleasure.